Directions: The Visitor Center at the Fort Davidson State Historic Site [ Waypoint = N37 37.227 W90 38.328 ] is a good place to start the tour. After you leave the Visitor Center, the Muse recommends you take a short walk of about one hundred yards and read three interpretive signs just west of the Visitor Center. These signs give a good overview of the battle. But the Muse suggests you wait to visit Fort Davidson until later in the tour. Description: There are a number of interpretive signs describing Price's 1864 Missouri Raid and the fighting that occurred in the Arcadia Valley in September of 1864. There is also a scale-model replica of Fort Davidson. 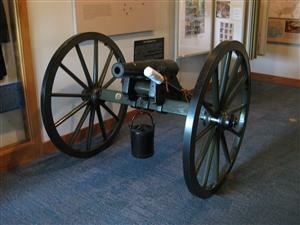 There are a number of artifacts in the Visitor Center, including a Model 1831 Six-Pounder Gun used by the Confederates and a Woodruff Gun used by the Federals. 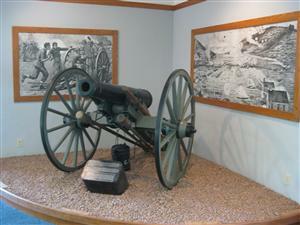 This iron six-pounder field gun is believed to be one of two Confederate cannons emplaced on Shepherd Mountain during the Battle of Pilot Knob, After opening fire on Fort Davidson, this piece was dismounted while the other cannon was hauled away to escape Federal fire. The dismounted gun could not be retrieved from the mountain and was abandoned. In the early 1900s, loggers found the gun and dragged it to a farm near Pilot Knob. In 1967, St. Louis Civil War enthusiast John L Wagner learned about the gun, purchased it, and restored it for use fin reenactments. The Missouri Department of Natural Resources acquired this unique artifact from Wagner for display in the visitor center planned for Fort Davidson State Historic Site. Missouri State Museum researchers believe that this gun belonged to Capt. H. C Hynson's Texas Battery. 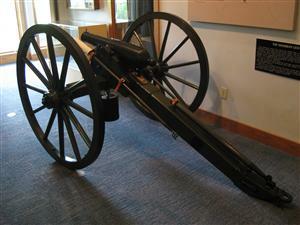 The barrel is not typical of Civil War artillery, but is similar to the U.S. Model 1831 iron six-pounder. The 6 5 inch barrel has a bore of 3.675 inches and was found to be loaded with two six-pound solid shot. According to an eyewitness, the gun was dismounted by a shot from a Federal 32-pounder siege gun that killed and wounded 12 men. 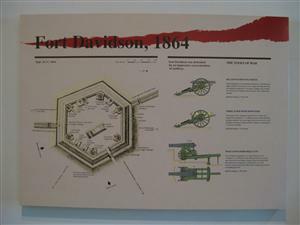 The “Fort Davidson, 1864” interpretive sign has a drawing of Fort Davidson showing the artillery platforms and other features of the fort in 1864. The sign gives a little detail about the artillery pieces that were used by the Federals at Fort Davidson. 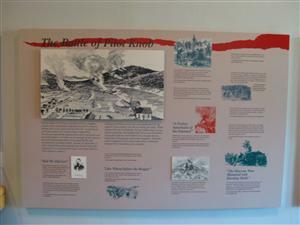 The Battle of Pilot Knob interpretive sign provides an overview of the battle. 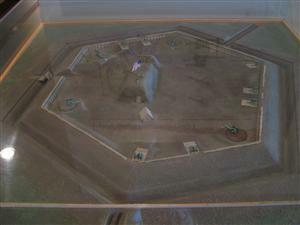 There is a scale model of how Fort Davidson looked in 1864 during the battle. This small bore cannon has a bore size smaller than a mountain howitzer and could travel relatively easily with last moving cavalry units as Flying Artillery. Invented by James Woodruff and made in Quincy. Il., by the Greenleal Foundry. The US. Army did not want anything to do with these small guns until President Lincoln suggested that the ordnance department reconsider its decision. Thirty ended up being produced for the army and six were purchased by the city of Quincy for protection. At least four Woodruff guns ended up in the area around Pilot Knob by I864. 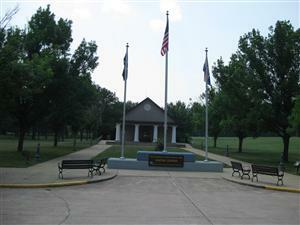 They were assigned to the 3rd Missouri State Militia Cavalry. Co. K. along with two 12 pounder cannons. There are only six original cannons still known to exist. Two are at West Point, two are in private hands, one is in New York and one stands guard in White Hall. Il. Accoutrements tor this display provided by donations of David Hagler, Patterson, Mo. and the Turner Brigade - Civilians. St. Louis. Mo.